Global warming is good for business by Kimberly B. Keilbach. 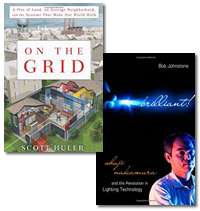 Quill Driver Books, 2009.Provides practical advice on identifying entrepreneurial opportunities, and describes new green technologies that have the potential to power a new generation of innovation. Two billion cars: driving toward sustainability by Daniel Sperling and Deborah Gordon. Oxford University Press, 2009.Describes the reluctance of auto manufacturers to employ promising new technologies for reducing the auto’s carbon footprint and recommends solutions for change. How to cool the planet : geoengineering and the audacious quest to fix earth’s climate. by Jeff Goodell. Houghton Mifflin Harcourt, 2010.Explores options for cooling earth’s climate in a hurry, focusing on strange and promising ideas that are beginning to attract research dollars, such as “cloud brightening,” pumping water droplets into the air to buffer ocean clouds’ reflectivity. Strategy for sustainability: a business manifesto by Adam Werbach. Harvard Business Press, 2009.Shows business leaders how to formulate a green strategy attuned to social, economic and cultural trends, and to implement it by engaging people inside the company and within the community.. 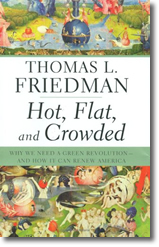 Hot, flat, and crowded : why we need a green revolution– and how it can renew America by Thomas L. Friedman. Farrar, Straus and Giroux, 2008. Following his blockbuster book on globalization, The World is Flat, Thomas Friedman has written another destined for a multi-year stay on the New York Times Best Sellers list. 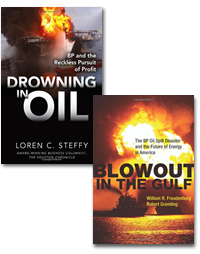 Hot, Flat, and Crowded focuses on three global trends that will soon undermine the quality of life of earth: Global warming, the rise of the middle class world-wide and rapid population growth. As billions more people adopt middle class consumption patterns, the effect on climate, natural resources and biodiversity will be devastating. In addition, the world will experience tighter energy supplies, a division between electricity haves and have-nots, and a transfer of wealth to petro-powers, which are largely anti-democratic. 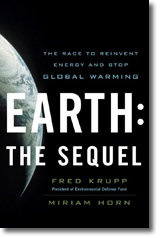 After focusing on the problems of global warming, population growth, and consumerism in the first half of the book, Friedman outlines his solution in the second. He proposes “Code Green” to transform our our current Dirty Fuels System to a clean-powered, energy-efficient, conservation-based system. Friedman calls for a revolution, the largest innovation project in American history. Overall, this is an optimistic book. Friedman says that thirty years ago, America could be counted on to lead the world in response to the important challenges of the day, but recently the US lost its way. The green revolution is an opportunity to become that city on the hill once again, providing leadership on healing the earth.